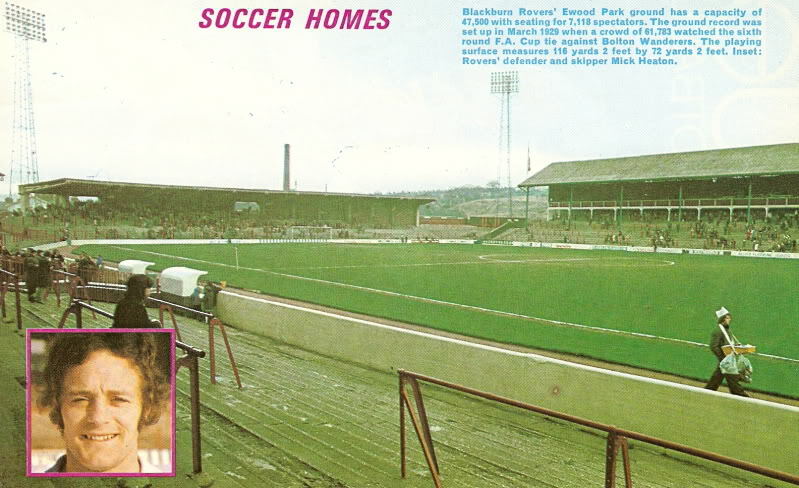 Blackburn Rovers are one of those teams that have stayed true to their roots and have played their football home games at their Ewood Park ground since 1890. It has of course changed considerably since then but is still one of those stadiums that look like a real football ground, a rare thing nowadays !! "Blackburn Rovers Ewood Park ground has a capacity of 47,500 with seating for 7,118 spectators. The ground record was set in March 1929 when a crowd of 61,783 watched the sixth round tie against Bolton Wanderers. The playing surface measures 116 yards 2 feet by 72 yards 2 feet. Inset : Rovers defender and skipper Mick Heaton." I have also found an absolutely stunning piece of old film footage on Google that shows the old Ewood Park Stadium as it used to be in the 1970s.